Good GRIEF has it been a long long LONG week of travel. Let’s see, 4 planes this week, 3 planes last week, thousands of miles in between, and I am toast. While the first leg of two weeks of travel was for pleasure, this week was just.so.tiring. So I think I deserve to revel in the fact that I am home, I am in my own home, my own routine, my own FOOD. Getting a promotion!! I had my review while I was in the office this week in California and not only did I get a pretty sizable raise, I got a promotion! I was floored. I was hoping it would be coming soon, but had no idea my boss had been working on this for months. Feeling like a hugely valued employee. Combine the aforementioned with the nicest, most heartfelt, most complimentary email I have ever ever received from ANYONE and I am a very happy employee. My boss’ boss (who becomes interim boss for me when she is on maternity leave – again – next summer) sent me not only a Christmas card with a gift card inside, he sent me an email that said – in effect, this: Perhaps the most special thing about you and many won’t realize, is that you are making people around you better than they were before they met you. I can guarantee you that in their next job they will take the things you have taught them and they will look much smarter and accomplished than they are…some will give you credit, some won’t, but I will know they are improved because they worked with you. And a weekend ahead that is almost planLESS. Yep, you read that right. An almost planLESS weekend. I. Cannot. Wait. Happy Friday, friends, make this weekend a goodie! Every single time I walk out of barre n9ne, I feel like I am finally starting to hit a good stride as an instructor. That I AM an instructor. It’s been a little almost six months (!) since getting certified, and while there is a LOT more to learn, refine and develop…I just love teaching. Every single time. Every single time, I feel that rush of adrenaline and excitement. I feel awake, alive, and refreshed (even if I may be crawling out of bed at 5:09 am – yes :09 to be exact – and wondering how on earth I’m going to be AWAKE enough to motivate, instruct and push!). When I have a conversation with a 60-day challenger and see their elation over how well this program just works and how fit they are becoming and how motivated they are…it makes me proud. It keeps me motivated myself. Every single time. And every single time, when I hear a groan, gasp or see someone shut their eyes and push through the burn, I smile. And then I push them more. When I look around, at my life, at my (busy) schedule, at my body, at my eats, at everything, it all comes back to barre n9ne and this lifestyle I’ve built for myself. I smile again. Every single time. And every single time I have the opportunity, I pay it forward, my way of giving thanks, of spreading this passion, this life, this happiness. Because it truly is the balanced life I have looked for, strived for, yet never achieved the way I wanted. Until now. I am supremely amazed at how differently I’ve handled eating during this trip. While I have had several trips across three time zones since I started the barre n9ne challenge last year, which has made me more mindful and aware of eating when hungry, not out of habit or mindlessly, but this trip has just felt the most different of them all. For starters, I was *really* worried I’d be ridiculously hungry during Monday’s flight since it left at 8 am, and arrived at 2:30 pm (in my brain, but 11:30 PT) where I would have to endure what should be breakfast and lunch, yet only be barely lunchtime on the West Coast when I arrived. For the first time, I forced myself to retrain my eating into West Coast times from the minute I stepped off the plane. And surprisingly? It worked! I wasn’t heinously hungry the entire flight, either. I scored some steel cut oats at the hotel (last minute score! Arm pump!) and just needed a banana to sustain me until I landed and could grab a bite once I got my car, maneuvered my way out of LA and go to my office, around 12:30 PT. That has seriously been my golden ticket this week. I haven’t woken up famished (hungry, but not wilting! ), and I’ve generally been hungry at the ‘right’ times on the West Coast. Score. I ran outside – alone – for the first time EVER since I started this job 18 months ago. (well, that’s not entirely true. I did run on the beach AT my hotel when I first started…but that doesn’t feel quite the same, since there were people everywhere. If that makes sense). I knew I wanted to finally run outside, when it would be light enough to do so safely (many of my trips up until this point have been during winter months where it was just too dark to do it previously). And so I would not get lost, I came up with a genius plan (if I do say so myself!). I ran FROM my hotel TO my office. Since I know the route by heart and it’s about 2.4 miles one way, making for a solid just about 5 mile route. 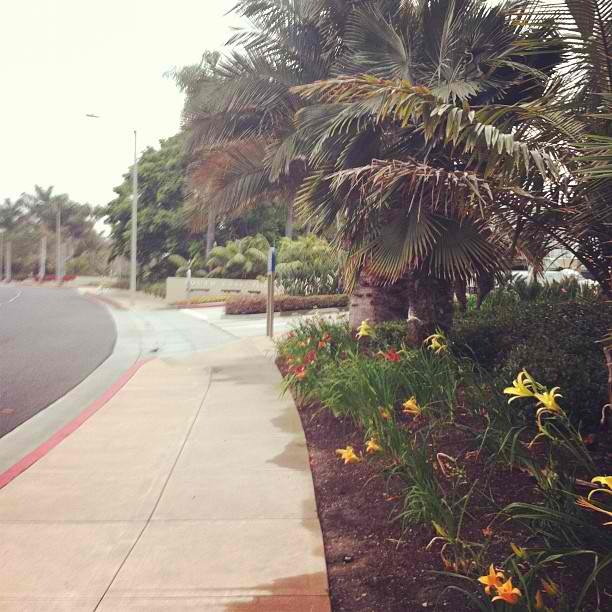 What most surprised me, beyond loving being outdoors and running IN Cali and ON flat, flat, FLAT roads was how PRETTY everything smelled. I smelled flowers everywhere. I heard birds chirping. I even heard the electrical wires above me buzzing. It was quiet, even on usually-busy main roads (it was 5:30 am, I guess I can see why). I LOVED it. We had our long-awaited event this week for work. (the reason I am out here this week) And it was SO cool to see an event come off without a hitch, one that my boss and I have been working on for months. It was fun to interact with those that arrived, from the students from a local college (that were part of the competition for this particular event), to my company’s executives, to the media that came, and to my co-workers, too. I finally felt comfortable chatting on the fly with people and not feeling like I stuck out like a sore thumb. Perhaps it goes back to feeling confident in who I am, for the first time pretty much ever, huh? This whole shifting focus, thing? Yeah, it’s REALLY working for me. I have not dreaded this trip much at all (besides the always hard goodbyes to M), I have looked forward to it. I have embraced the challenges, I have done new things (running alone, as I mentioned, for starters! ), and I have just enjoyed the time and the opportunity. It has gone a long way, and I couldn’t be more glad, or more relieved at that. PS – THANK YOU to everyone for all of your feedback, compliments, and support on my post yesterday. It meant so much to see such positive feedback and enthusiasm. I was nervous to post before and after pictures for a number of reasons, but am so glad the message I wanted to get through as part of that came shining through, rather than it being uber focused on numbers and such. THANK YOU! I wish there was smellavision (er, blogavision?!) – those flowers smelled GOOD! Visualize the end game. The result. That’s what you’re supposed to do when you set out on a journey, a challenge, towards a goal. But at first, I never could quite visualize the end game, the result, from the opportunity I was granted a year ago for the barre n9ne 60 day challenge. Because I didn’t quite believe. In myself. Or even in the challenge facing me. Or in all that it could be, if I set my mind to it. I was used to going halfway and stopping. I was used to the field goal. I had never achieved the results I wanted or thought I could attain. 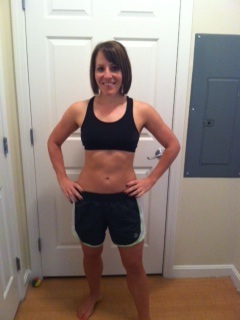 I didn’t believe in “smarter, not harder.” I didn’t believe, even, (not fully) in lifestyle change. On day one, this was the me I was then. Not quite believing…hoping, not unable to visualize. Frustrated with myself physically, feeling like a hamster on a wheel spinning and spinning but with little to show for it, not understanding that I had lost the ability to see moderation in my eats, and having lower self esteem than I ever wanted to admit or be faced with. Day one of the 60 day challenge was a scary day for me. Because it meant facing the things that I had ignored and pushed aside for fear of number fixation, the reality of the situation and doing something I’d never done before. *Not* stopping at the field goal…but going for the touchdown. The last year has been a year out of my comfort zone, and not only has it taught me that I have the power to reach the goals in which I set for myself, for perhaps the first time in my life, it’s also given me an opportunity I never thought possible. To pay forward what I have learned, in lifestyle changes, the power of a barre workout and how to finally – finally – be comfortable in my own skin. And, as a result?…this is the me I am now. When I took this picture, I saw it for the first time. The end game that I never thought possible. 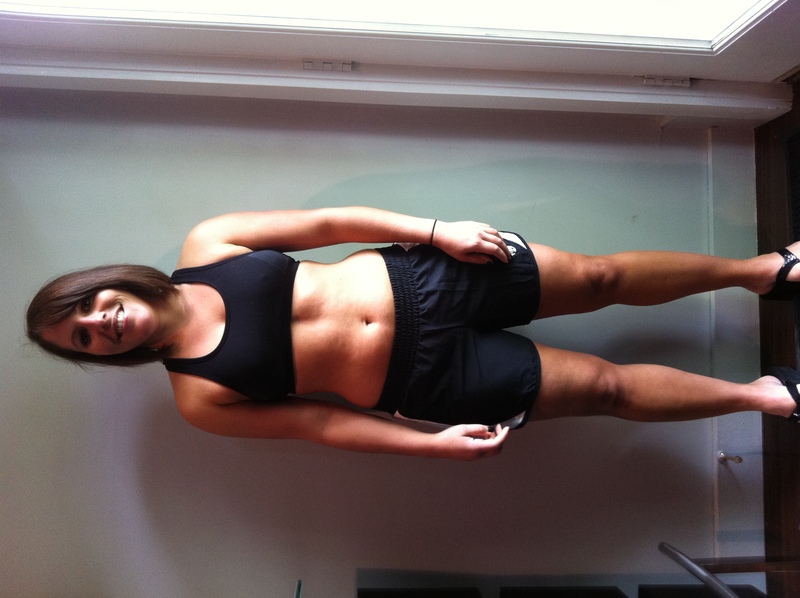 I had achieved the ‘after’ that I always envied on infomercials (even pooh-pooh’ing the words these ‘success story’ spokespeople said…words like life-changing, being the me I always wanted to be, etc), losing the inches, pants sizes and weight. Perhaps the best part of seeing this picture? Besides the renewed gleam in my eye that speaks happiness, confidence and pride? Realizing that there is no end game.This is the life I have built for myself. And it is the life that I will continue. 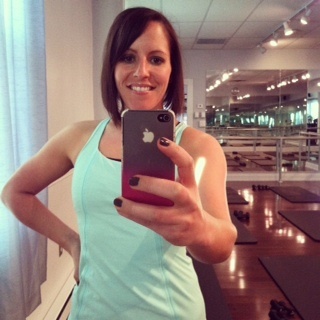 Moderation, real, wholesome, fueling foods, and a love for barre n9ne, from teaching, to taking classes. This life. A life that rails against the word ‘diet,’ that focuses on real foods, no gimmicks and the magic bullet of consistency that has opened the door to the happy medium I never thought was possible. And ultimately? This is a life that I will continue to pay forward. Because this happy medium life is pretty damn good . Thank you, Tanya, for your belief in us, to my sister Jess in sharing this journey with me (read her post here on her results and thoughts on the last year! ), to the barre n9ne community for being such a supportive family (and believing in us then, as the first ‘challenges’ and now, as instructors), and to all of you – my family and friends, for supporting, encouraging and believing. Spreading the barre n9ne passion! 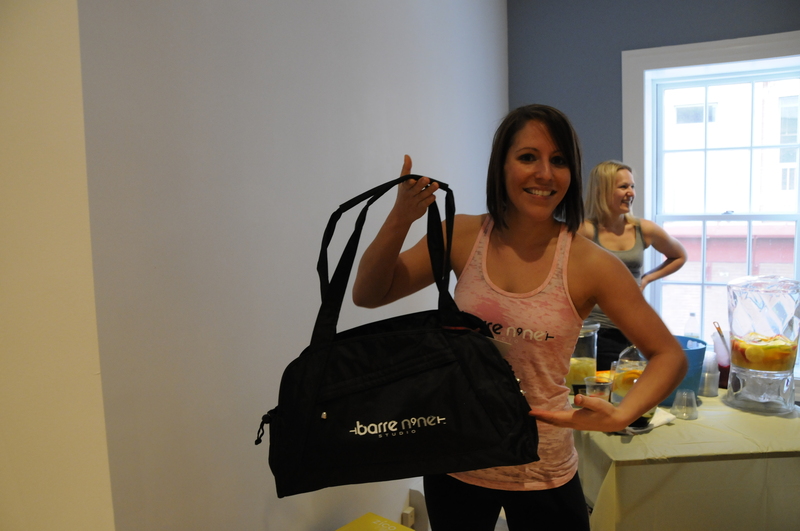 If the epic surprise party wasn’t enough, this weekend also included the grand opening of the new barre n9ne studio, (which just so happens to be a mere 3 miles from where I live), an event we’d all been gearing up for excitedly for weeks. 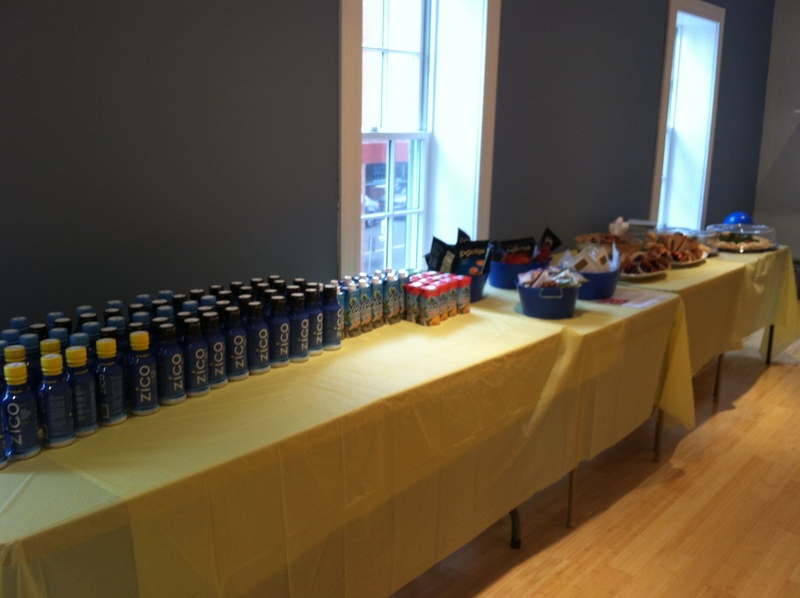 My sister Jess and I have been working hard behind the scenes, gathering some fantastic sponsors, including Zico, Coach’s Oats, popchips, Vita Coco, Chobani and Love Grown Foods’ Granola (see Jess’s post here with more details too!) and the day came off without a hitch. 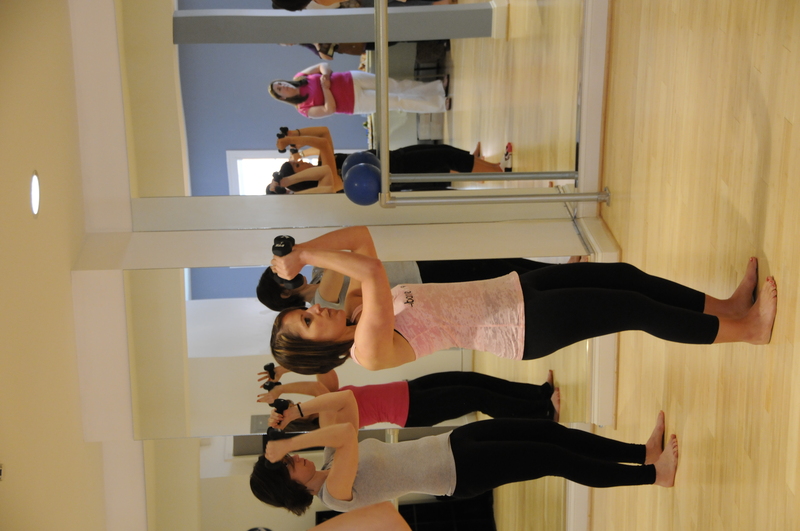 But beyond that, I was so thrilled to be part of a team that cares so deeply about this studio, about its success and expansion, and the passion we all have for barre-style workouts, and not just *any* barre-style workout, but barre n9ne method, specifically. As Tanya introduced all of us, and our backgrounds, I just tried to capture the memory and sear it into my brain, because a year ago? None of this even seemed fathomable. It wasn’t even a thought in my mind. A year ago, I was unhappy in myself, my body, my self-image and distastrous ability to tear myself apart at the drop of a hat. But today? I don’t think I could be much happier than I am and I truly credit this journey with so much of that change and happiness. 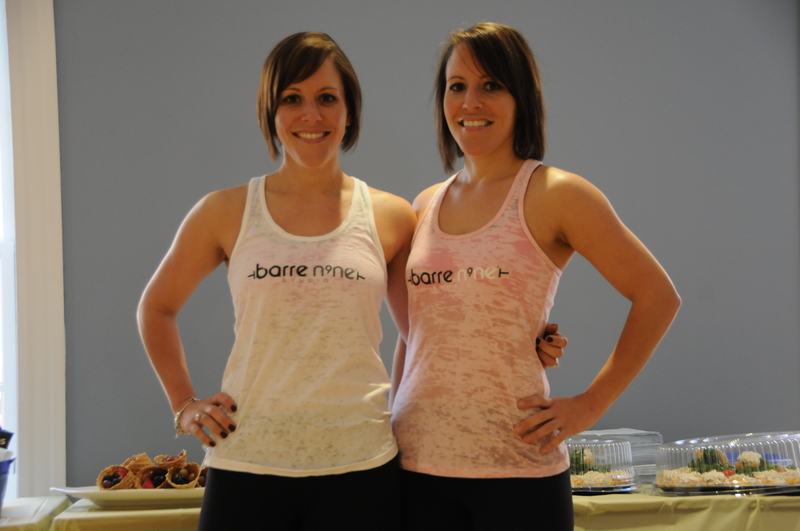 I’ve grown in so many ways, I’ve met incredible and inspiring people and seen equally incredible progress and ability in the clients of barre n9ne. And this next phase? Not only experiencing its growth but being instrumental in making it a success? Truly a blessing. Walking around and talking to prospective clients and new and longtime clients was an absolute joy. It was an adrenaline rush to hear the excitement in people’s voices, hearing our stories of the inagural 60-day challenge we won and have since helped carry forth into an epic success for so many others, hearing their compliments, saying things like “you can tell this stuff really works, the instructors really fit the image of lean and tone and fit!” You can’t pay someone to say that, ya know? It’s passion and truth. Beyond the demo classes (that were so fun to do together! ), and the food, and the fun and fruity drinks, seeing the studio alive, and seeing how far this studio – and we – have come, was an incredible experience. I cannot thank Tanya enough for taking a chance on us last April. Because ever since that day? I’ve not gone halfway and stopped. I’ve not ‘just’ gone for the field goal. There is no such thing as anything less than a touchdown. Go all the way. PS: I taught my first 6 am class this morning and while it was a very small class, one of the very first women I talked to, a past client who had moved and was now much closer to this studio, came in for her first class in maybe a year. It was just incredible to see how happy she was to be back at it. What a way to start a Monday! !